Frank Speyers (b. 1947), was raised in the Netherlands until 1956 when he immigrated with his parents to Canada. He came to the States in 1967 and went on to earn a Masters in Communication Design from Pratt Institute (1977) in New York City where he was influenced there by the design theories of Herb Lubalin and Christopher Alexander. While pursuing post-graduate studies at Harvard Graduate School of Design in 1990, he collaborated with Massimo Vignelli in the formulation of design pedagogy. Frank worked as a brand designer for a number of Fortune 500 corporations, prior to teaching design as a language. 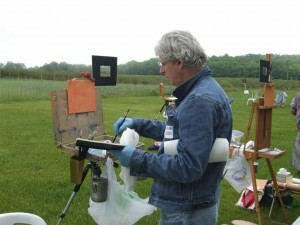 Frank traveled to California to learn plein air painting. About half his work is done on site, or plein air. The rest is completed in his studio from sketches and photographs.